Our family has resided in the areas we serve since 1977. No one knows pests and lawns in South Florida areas like we do. We will provide you with expert advice regarding local insect, weed, disease and fungal control problems common to Southern Florida. We have never seen a problem we haven’t been able to resolve and we guarantee your complete satisfaction. We are committed to being responsible stewards of the environment and that means using only the most environmentally friendly and effective products in your home and on your lawn. We take great pride in the quality and care of our work. We focus on the little details that make a huge difference in the ultimate quality and health of your lawn and home. We guarantee quick turn around times, quality pest control and lawn care services and affordable prices. If you are looking for a company you can rely on you have come to the right place. Our customers are our highest priority. We are open 24 hours a day, 7 days a week and we offer emergency service around the clock. We strive to provide the best customer care experiences possible. 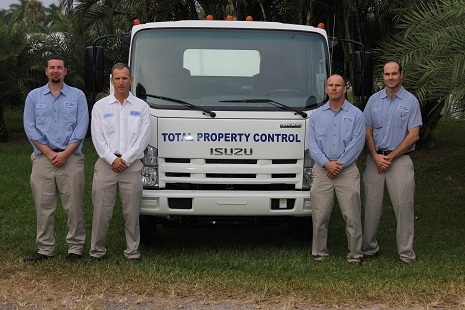 Total Property Control follows all IPM integrated pest management protocol. These are the same guidelines maintained by schools and nursing homes. IPM programs use current & comprehensive information on the life cycles of pests and their interaction with the environment. This information, in combination with available pest control methods, is used to ensure the least possible hazard to people, property, and the environment. Typically we will focus on the perimeter of the property, keeping the insects out. Thus no insects make it into the property, and no need for unnecessary chemical applications to the interior. If there are interior problems we try baiting as a first choice & then finally spray applications where necessary. Your home and lawn will be completely safe and pest free when you entrust it to Total Property Control. Total Property Control stands behind our products and services. We want you to be fully satisfied with every visit. If not, just give us a ring and we will make it right.